We are dealing with various kinds of Glassy Carbon products. Customer's special processing order such as pipe, pot shape etc. or custom sizing order is also available. Glassy Carbon has a quite unique structure. This material contains random combination of basal plane and edge plane. The figure, at the right, shows the model illustration introduced by G. M. Jenkins and K. Kawamura. It becomes an outstanding material, which can be used for the electrode in an analytical chemistry domain as electrochemical measurements, detection of high-speed liquid chromatography, biosensor and others. Glassy Carbon has quite unique structure. 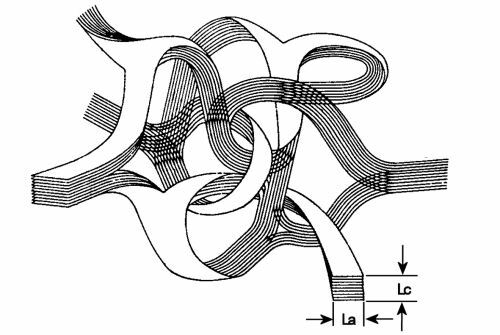 As the figure below shows, this material contains random combination of basal plane and edge plane. Wide selection of the working electrode is available. Customization is also available. RDE and RRDE were designed to fit in the RRDE-3A Rotating Ring Disk Electrode Apparatus. 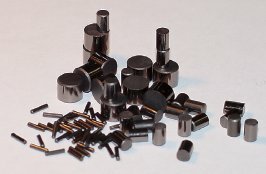 Custom made electrode for RDE (rotating disk electrode) or RRDE (rotating ring disk electrode) is available.